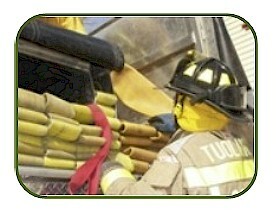 Volunteer Firefighters serve the community by responding to a wide variety of situations, ranging from emergencies that immediately threaten life or property to routine citizen requests for information or assistance.Volunteer Firefighters are called upon day or night to perform duties in the following general categories:fire suppression, emergency medical aid or rescue, hazardous material responses, emergency standby, training and public education. Possess a valid California State Driver's License. Possess and maintain physical conditioning necessary to perform efficiently in emergency situations; meet medical and physical agility standards as established. Be capable of establishing and maintaining effective working relationships with fellow firefighters, career staff, and the general public; to respond readily to directives and work effectively as a team player. In the performance of a Volunteer Firefighters duties you will be assigned to place equipment, lay and connect hose, operate high-capacity pumps and direct water streams. You will raise and climb ladders, use chemical extinguishers and a self contained breathing apparatus. You will be responding to medical emergencies of all types.